Today around noon, I thought about going out for dinner. I was thinking about Azia. Once afternoon came around however, the skies turned dark and soon I wasn't in the mood to go any where. I have an irrational fear of the Minnesota weather. My fear is that one day I'll be caught outdoors in the path of a tornado. Coming to think of it, it might not be too irrational. Last year, it almost happened; I was driving, listening to XM, and had no idea that a tornado had touched down not too far away because 1) I was not paying attention to the weather news, and 2) my windows were rolled up so I could not hear the sirens. It is better to be safe than sorry. That being said, dinner plans were forfeited for my homemade flat bread. And hot chocolate. 1. In a large mixing bowl, mix together yeast and warm water. Set aside until foamy, about 10 to 15 minutes. 2. Add egg, honey and flours to yeast and knead into a soft dough. Move dough to a floured surface and continue kneading for three to five more minutes. Return to the mixing bowl, cover with a tea towel and allow to rise for 30 to 45 minutes. 3. Meanwhile, in a skillet set over medium heat, add two tablespoons of vegetable oil. Add thinly slices bell peppers to the pot, season with sea salt and cook for 15 to 20 minutes, stirring occasionally to prevent burning. 4. Once the dough has risen, set oven to 350 degrees F. Roll into a disc or rectangle to fit your baking sheet (which has been sprayed with cooking spray.) Brush mustard onto the entire surface of dough and sprinkle minced garlic throughout. 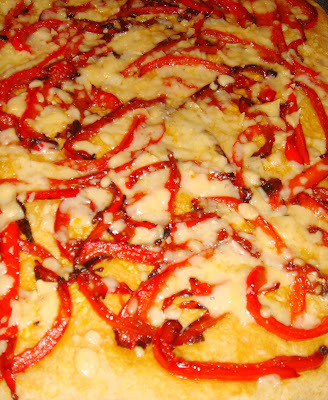 Top with cooked bell pepper, followed by cheese. Bake for 15 minutes. Consume immediately. Wow, does that look good! This is going into my "try me" file. I love the caramelized look there! It must have had so much flavor! oh my god that looks amazing. i can't wait to give that recipe a try myself! Thanks everyone for all of your kind comments! This recipe is very popular in my home. I have also made it with caramelized onions and fennel in the past, so, yes onions and peppers will work well here. I hope all of you enjoy it as much as we do, and thanks again for visiting. Oh, how gorgeous! That Flatbread looks incredibly scumptious! Mmmmmmmm! 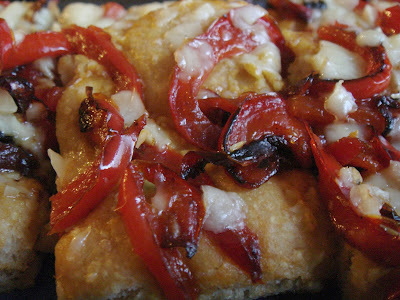 Love flatbread, love cheese, love red pepper. Great combo. That being said, I love hot cocoa, too, but not with the aforementioned. Now, with a few of those dynamite looking brownies...now you're talking! This recipe is making my stomach growl. I'm a sucker for flatbread!